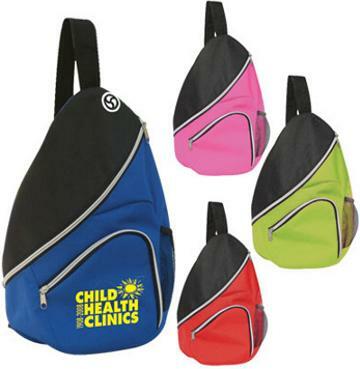 Inexpensive Promotional Sling Bags in Bulk in fashionable colors, custom embroidered or silkscreen imprinted with your logo. We also supply blank (not imprinted) slingbags in bulk: see the Price Table below. Lowest cost in USA and Canada for wholesale personalized slingbags . Free artwork design. American clients pay no taxes. Unit prices below are for blank (not custom imprinted) sling bags, or they include your 1 color, 1 side custom imprint, or they include 5000 stitches of custom multi-color embroidery. You may order any in-between quantity; assortment of colors is allowed. Additional Imprint colors: add $0.50 per imprint color, per sling bag. Please Email us your logo in order to estimate the number of stitches (unless you know it already). You don't pay Setup Charges for embroidered sling bags, but you need to pay for the Embroidery Tape (in case you don't have one): $55.00 for up to 5000 stitches of embroidery. Embroidery over 5000 stitches: add $0.30 for each additional 1000 stitches, per sling bag; also add $5.00 for each additional 1000 stitches to the basic Embroidery Tape cost of $55.00. Colors: Royal Blue/Black, Red/Black, Solid Black, Gray/Black, Dark Green/Black, Pink/Black, Lime Green/Black (see photo). Imprint Area: Embroidery: 4" x 4"; Screen Print: 4" x 3"
Typical Production Time: 5-7 days after artwork approval; 3 days rush production is available: contact us.